Screen Film Award are regarded as country’s most respected and justified awards because over the years the awards have maintained a reputation of being just in choosing the awardees without being impartial or unfair as is routine at other awards nites. Thus living up to its reputation the Screen Awards announced recently have picked multiple new talents who are deservedly the true recipient of this prestigious honor. 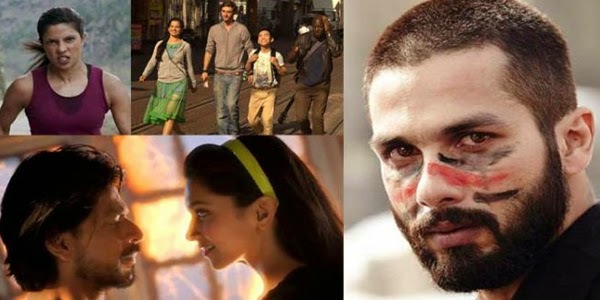 Shahid Kapoor, who had been going through a rough patch in his life, was just fully awarded the Best Actor (male) trophy for HAIDER, while Priyanka was declared Best Actor (female) for MARY KOM at the 2015 Life OK Screen Awards held in Mumbai. However in the Popular Category it was Shah Rukh Khan and Deepika Padukone winning top honors in HAPPY NEW YEAR. Tahir Raj Bhasin and Huma Qureshi the two new comers who impressed the audience and critics alike with their histrionics in MARDAANI and DEDH ISHQIYA respectively were deservedly awarded the Best Actor awards in negative roles. Movies which were really different and truly ‘Hat Ke’ were applauded the pointer being low budget QUEEN won the Best film award and its director Vikas Bahl was awarded the Best director award. MANJUNATH, the hard hitting movie that depicted the true story of Manjunath Shanmugam - the Indian Institute of Management Lucknow graduate who was killed in Lakhimpur, U.P., in November 2005, for his stand against corruption and fuel adulteration was awarded the esteemed Ramnath Goenka Award. Sandeep A Varma, who directed and wrote the brilliant screenplay, was awarded the Best Screenplay Award. ANKHON DEKHI, another small budget yet critically acclaimed movie was the toast of the award nite. It won multiple awards Best Story for Rajat Kapoor, Seema Pahwa in Best Actor (Female) Supporting Role category, Best Ensemble Cast. FILMISTAAN, the path breaking movie of 2014 too won the hearts of the judges and the judges had no reservations in awarding Nitin Kakkar the Most Promising Debut Director award. Besides the two new sensational discoveries of 2014 viz. Sharib Hashmi and Inamul haq were too awarded Best Comedian and Best Supporting Actor respectively for their commendable performance in FILMISTAAN. Aamir Khan’s PK was fittingly awarded the Best Dialogue award to Rajkumar Hirani, Abhijat Joshi for intelligent and thought provoking dialogues.